By Peter Lance Updated March 17th, 2015. Andrew Jarecki is a rare film maker. The director of the 2010 feature film, “All Good Things,” just couldn’t let the story go. 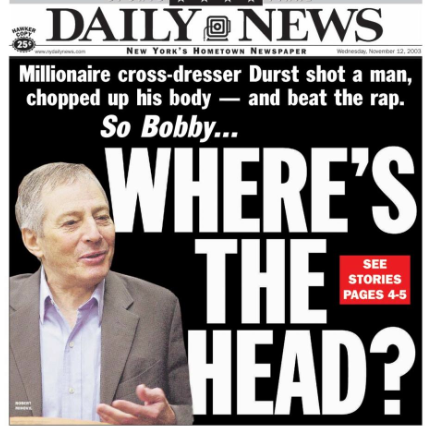 He stayed on it, like a hungry dog on a bone, biting for the truth and in the last 24 hours as HBO aired the final segment of his documentary series he got it — the solution to a series of bizarre multiple murders by Robert A. Durst, the scion of a New York real estate dynasty, suspected for decades in the disappearance of his wife, the murder in Los Angeles of his close friend and the grisly Texas killing and dismemberment of his next door neighbor for which he was acquitted in 2003 after admitting that he’d posed as a woman and fled the scene once he’d sawed the victim’s body into parts and dropped them into Galveston Bay. He reports that Jareki and co-filmmaker Marc Smerling wrestled with their responsibility as journalist/filmmakers to protect their sources and their duty to bring the truth to authorities after Durst was inadvertently recorded making the incriminating remarks, “What the hell did I do… Killed them all, of course,” during a bathroom break while they were interviewing him for the HBO series “The Jinx: The Life and Deaths of Robert Durst” which finished is multi-episode run Sunday night. On Saturday, Durst was arrested after he walked into a New Orleans hotel under an assumed name.